For the second year in a row, the Philippines was cited as one of the 10 worst countries for workers in the world, according to a study by the International Trade Union Confederation (ITUC), a Belgium-based organization linking over 300 trade unions from 160 countries. In its latest Global Rights Index report, the ITUC gave the Philippines a rating of five, which signifies that there is “no guarantee of rights” for workers in the country. 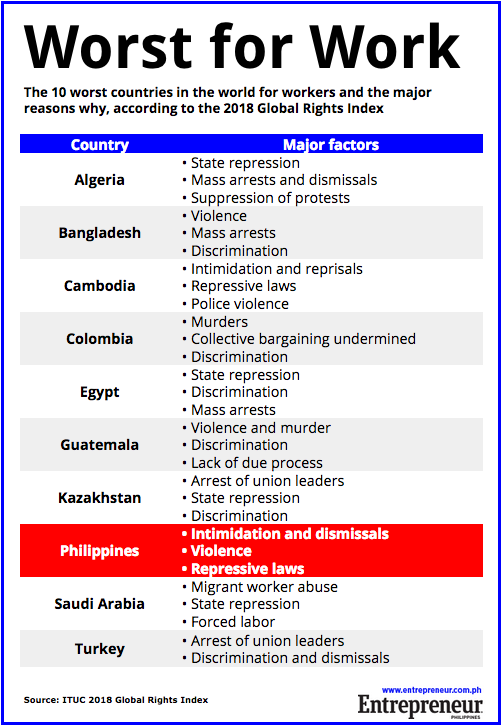 While it is one of 32 countries given a rating of five, the ITUC emphasized the Philippines as among the 10 worst countries in the world for individuals to work in due to three major factors: intimidation and dismissals, violence and repressive laws. ITUC cited the arrest of PISTON transport workers’ union leader George San Mateo last December as an example of these factors at play. The report also highlighted three cases of Philippine companies violating workers' rights. This marks the second time that the Philippines was included in the top 10, as it was also highlighted by ITUC in 2017. As well, the Philippines has consistently been given a rating of five by the Global Rights Index report since it was first published in 2014. Joining the Philippines this year in the 10 worst countries for working people are Algeria, Bangladesh, Cambodia, Colombia, Egypt, Guatemala, Kazakhstan, Saudi Arabia and Turkey. Countries in the Middle East and North Africa had the lowest averages among the world’s regions, followed by Asia-Pacific and the rest of Africa. The 2018 Global Rights Index report rated 142 countries based on 97 indicators based on workers’ and unions’ rights. They are then given a score from one to five, with one being the best countries in the world to work in and five being the worst.